Home > Names > Nance made of Elements > Post-it® Notes 4" x 6"
Nance made of Elements Post-it® Notes 4" x 6": Each 50-sheet pad of 4”x 6” 3M Post-it® Notes is printed in full color with original designs, texts and photos. Whether you want to stay organized or get creative, customized Post-it® Notes help you stick to your tasks! Adhesive is on 4" side. Check out other products with this design or view all stationery. 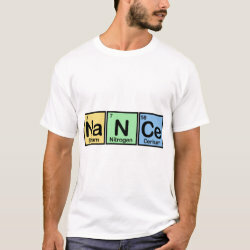 This post-it notes with our Nance made of Elements design is made-to-order by Zazzle.com. Zazzle offers 100% money back guarantee on our high quality Cute Union products. In case you are not happy with your purchase, you can always return your post-it notes for an exchange or refund within 30 days of receipt. See customer service for more information.